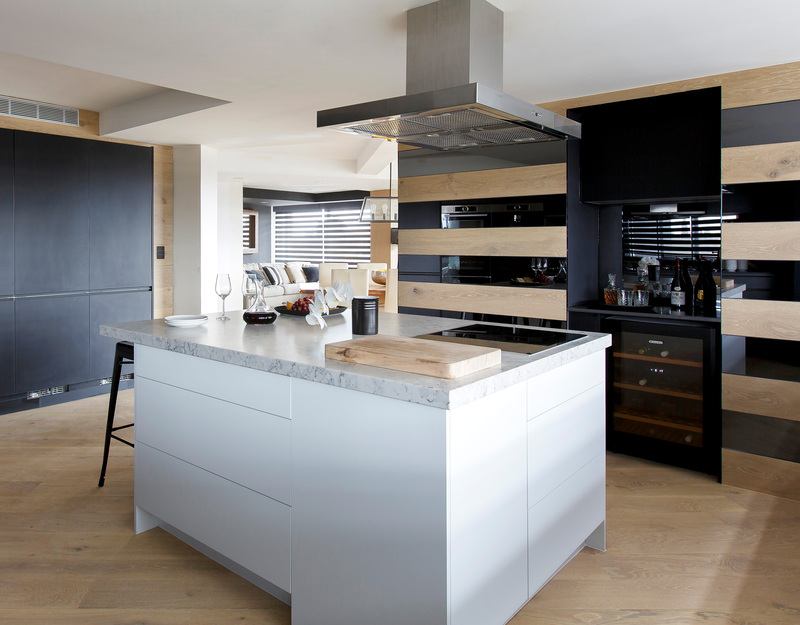 A Kinsman Kitchens starts with expert advice from concept to delivery. Designing a new kitchen is an exciting process. Begin by gathering ideas of layouts, designs and styles that appeal to you. Kinsman offers both a Designer Kitchen range and a flat pack Xpress Kitchen range, so whether you’re looking to create your perfect kitchen in a forever home, or do a quick upgrade for a flip property, you’ll find inspiring solutions for your needs. Need inspiration? Download our kitchen design brochure or browse hundreds of photos in our kitchen gallery. 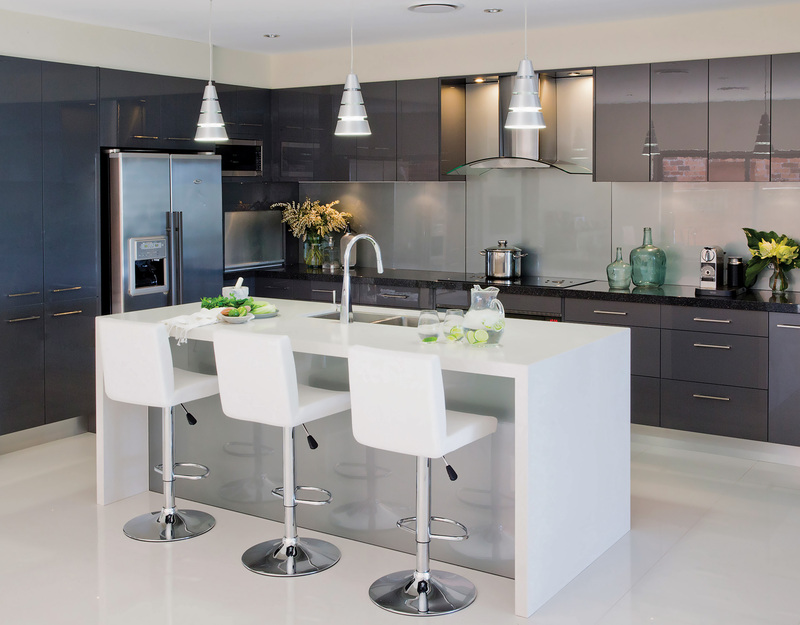 You need to work out what kind of appliances you want before your in-home consultation with a Kinsman design kitchen consultant, who will focus on your ideal layout, cabinetry and finishes. 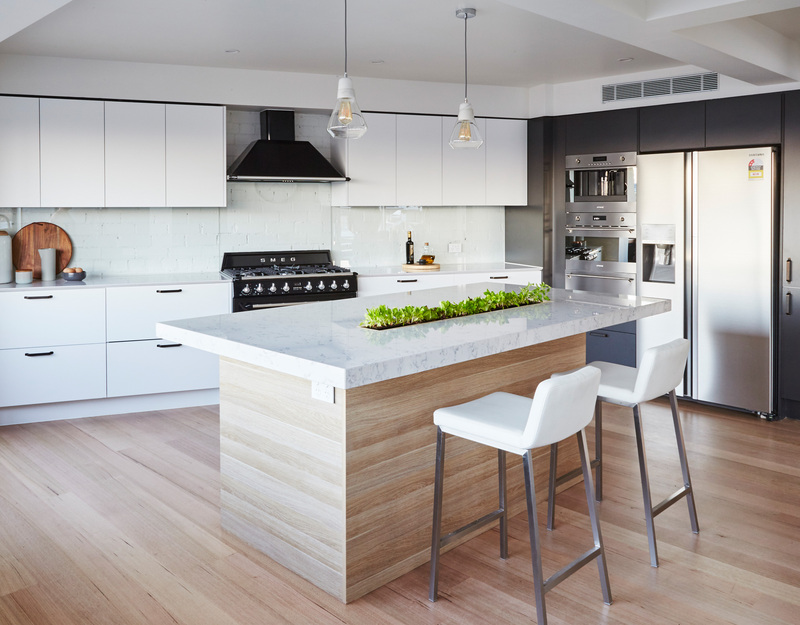 It’s important to allocate enough space early in the design process for any large appliances, like a double oven, French door fridge and small appliances that can be built in, like a coffee machine or microwave. Need help choosing your kitchen appliances? 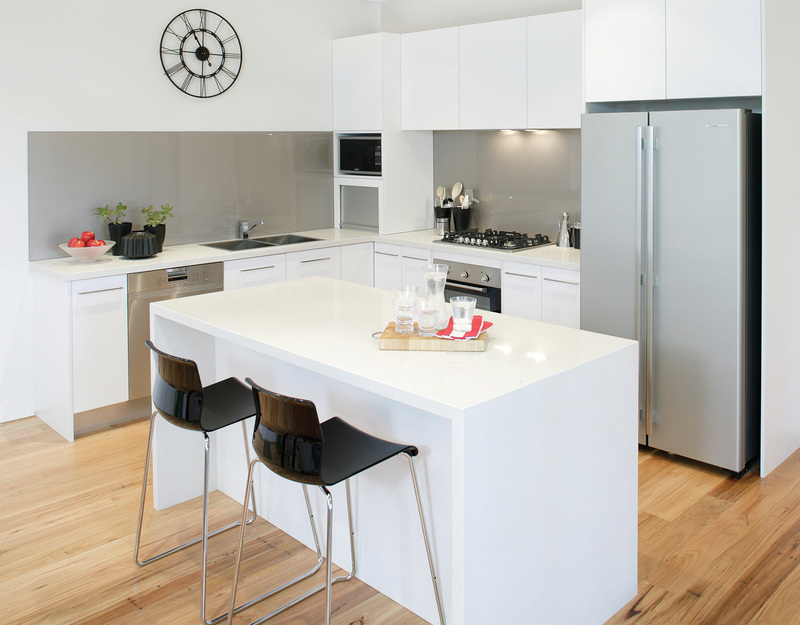 Our step-by-step guide will help you decide the right appliances for your new kitchen. Visit a design consultant in store for personalised advice and see our wide range of options and display kitchens. Our showrooms are complete with a variety of displays showcasing an array of colours and styles, benchtop materials and storage solutions. Our consultants can show you around and answer any questions you may have, and book your in-home consultation. You can book your free in-home design consultation while in store, or online. 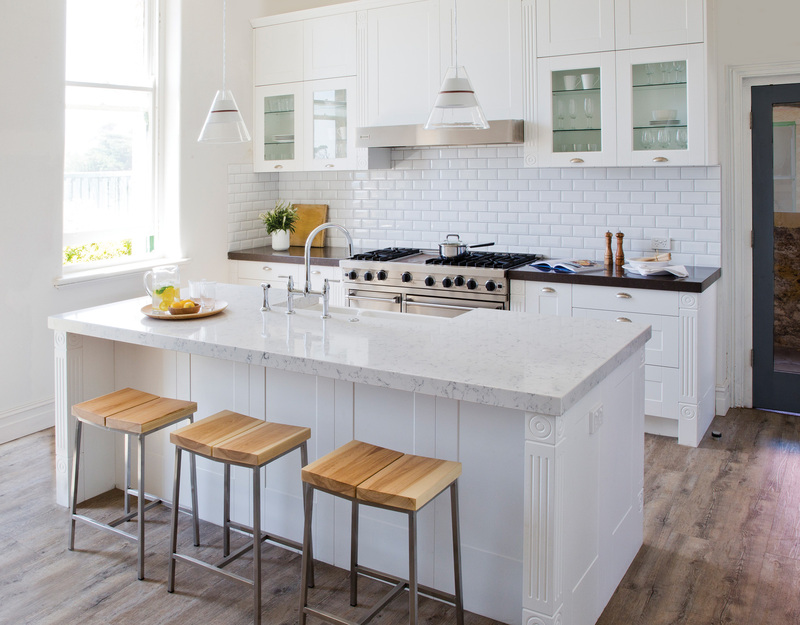 Our Kinsman designers are professionally trained to help you bring your kitchen vision to life. In the comfort of your own home, they will recommend practical design solutions for your space as well as provide advice on storage needs, material selections and the latest in kitchen trends. During your in-home design consultation, your designer will spend time listening to you, asking questions, showing you colour swatches and benchtop samples and measuring your space – no doubt they’ll also be able to suggest creative design solutions to maximise space or save money that you may not even have thought of! Once you are happy with your kitchen design, you will sign your contract and discuss payment options. Finance options will also be available to you during this initial design consultation. After you’ve sign the paperwork and paid a deposit, you’ll receive a welcome call from our Customer Liaison (CLO) Kinsman to discuss next steps and progress your job to site check. Remember that Kinsman is a SUPPLY ONLY company, so at this time you should also start considering the trades you need to organise, such as any plumbing work, electricals, and tradespeople to install your kitchen cabinetry, benchtop and splashback (see step 11). The site check is a very important step in the kitchen process. To progress your job to site check, walls must be up and gyprocked in the kitchen, and all appliance details confirmed. 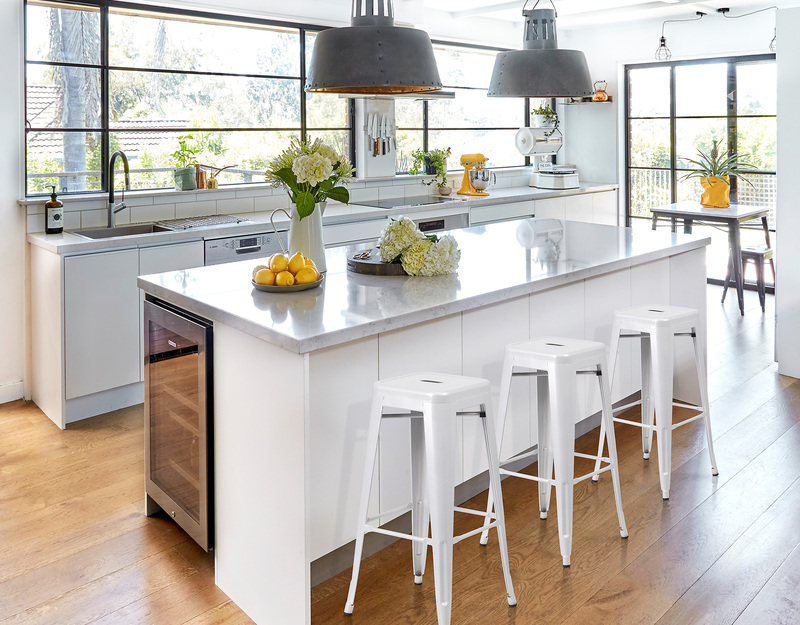 Your site checker will contact you to arrange a time, and during this meeting, he will explain and confirm all aspects of your new kitchen – confirming the doors, handles and benchtop finish. You will need to have confirmed your appliances and have all model numbers and specifications available during the site check, to double check that the appliances fit your design. Once the site check is complete and there are no further design changes, you can sign off, pay your 30% progress payment and accept your final CAD (Computer Aided Drawing) kitchen plans on the communications portal. This sends your kitchen into production. Shortly after you have accepted your final plans, delivery and installation dates will be allocated to your job. A member of our Installations Department will then contact you to confirm that it’s going into production. Your kitchen will then start to be manufactured (approx 4-6 weeks, however during peak periods it can take approx 6-8 weeks). A CLO will contact you to confirm final payment and delivery details 2 days prior to the delivery of your new kitchen. Once you receive the delivery date, contact your installer and make arrangements for access. In preparation for your new kitchen being delivered, please empty cupboards and clear contents from your old kitchen to ensure it is ready for removal. Clear a space for the new kitchen to be delivered into. Remember to leave enough time for this step and prepare spare boxes in advance as this can be a time consuming task. Kinsman is a SUPPLY ONLY company, giving you the benefit of dealing direct with your preferred tradespeople for all trades, installation, stone and glass. We can provide you with a list of preferred tradespeople, or you can select your own local tradespeople. Your designer will provide an estimate of the costs associated with the installation of a new kitchen, using costs that have been agreed by a network of licensed tradespeople that many of our customers have recommended over the years. Alternatively, you may choose to use your own existing trades’ contacts. You will enter into a contract with each of the tradespeople required and pay them directly once the work is completed to their satisfaction, allowing you to have complete control of the process. Ensure each tradesperson is insured and responsible for the warranty of their work. Your cabinetry will be delivered fully assembled and ready for installation by your nominated tradespeople. Once your cabinetry has been delivered, and your site is clear and clean, your new cabinetry can be installed. Don’t forget to organise your plumber, electrician, appliance installer and whatever other tradies you need to complete your kitchen. 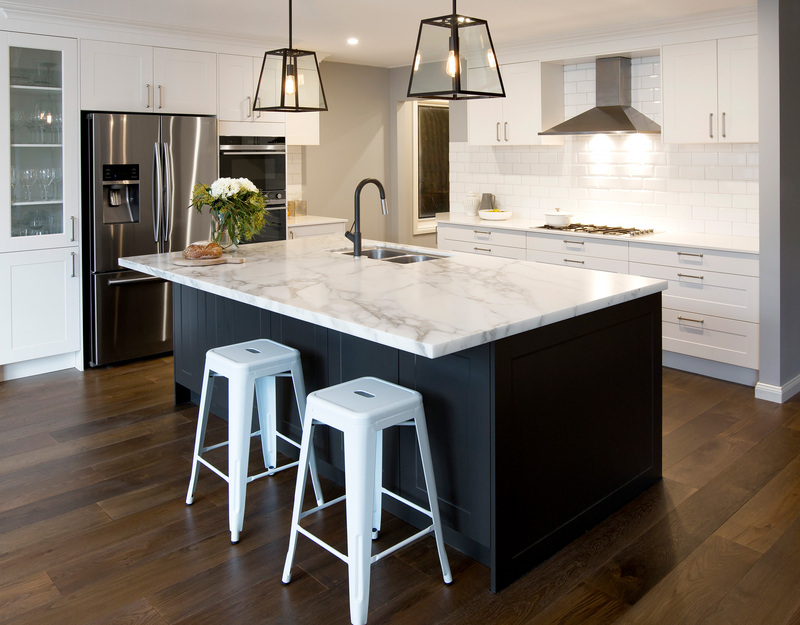 If you have chosen a stone benchtop you will need to contact your stone supplier to arrange a check measure once your kitchen cabinets are installed. The stone contractor will come to site to check measurements and the benchtop will be installed approximately 10 working days following the final measure. If you have a laminate benchtop being installed this will be delivered with your cabinetry. 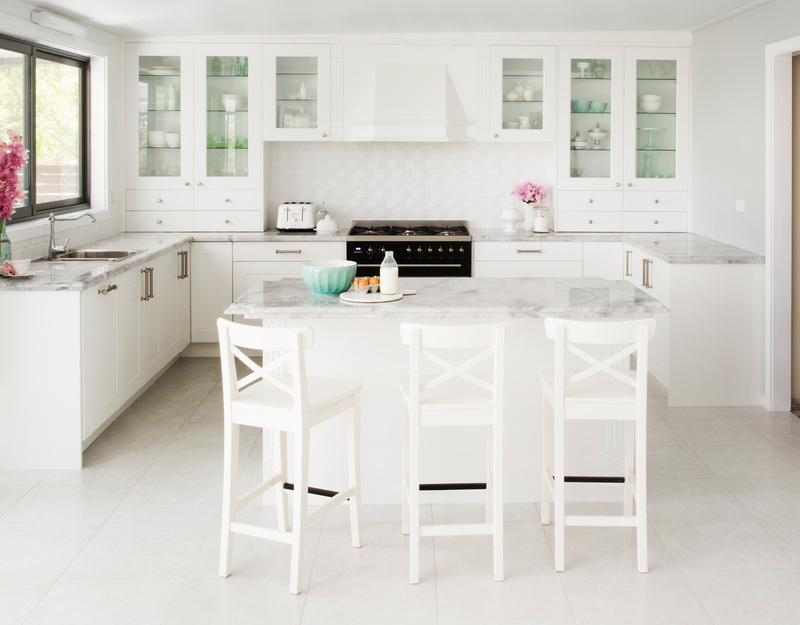 Once your cabinetry and benchtop has been installed you can organise the other finishing touches to your kitchen such as splashbacks, tiles, flooring and painting. If you have chosen a glass splashback contact the supplier and arrange a check measure after the kitchen and any benchtops have been installed. Note that the glass splashback will be installed approximately 15 working days later. When you make an in home design appointment, an experienced designers will visit you in your own home to discuss and share ideas, designs, colours and finishes for your new kitchen. As experts in the kitchen design field, Kinsman Kitchen designers can help bring your vision to life and offer advice on how to best use your kitchen space, assess your storage and functionality needs and recommend a practical design solution. When you’re ready to go ahead, Kinsman Kitchen start drawing up your kitchen plans, to make sure you’re 100 % happy with the final design. Book your Design Appointment Here.  We’ve built our reputation as appliance experts on over 50 years of service to Australians. As industry leaders, we’ll recommend the best brand appliances to match your budget and new kitchen. From ovens to cooktops, fridges to freezers, dishwasher to toasters, you can be sure that not only are you getting a great deal on your new appliances, but that they will enhance your new kitchen layout, design and functionality. Kinsman Kitchen friendly customer service team will keep you informed every step of the way through our Online Communication Portal. Using the Communication Port you’ll be able to contact Kinsman Kitchen, access stored copies of your plans and see notifications as your kitchen is built and delivery arranged – all at a time that is convenient to you.